"I don't expect you to believe anything. I told you my story—a common story, I know." While the edge of Italian neorealism was turning blunt, director Luchino Visconti redirected his cinematic energy. 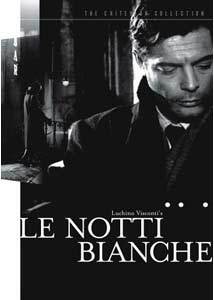 La Notti bianche is a watershed film of sorts, marking a transition between the more historically based material of years prior to the kind of fantastical, almost mythical pageantry that would mark later films, most notably The Leopard. Gone is the gritty rigor of neorealist drama, replaced by the surreal setting of a small Italian town, Cinecittá style. Fairy tale love is the focus now, ironically rooted in the work of Dostoyevsky, whose writings tend to evoke the kind of grime and harshness afforded by real life. Mario (Marcello Mastroianni) is a dreamer. After working a lowly day job that barely pays for his dingy hotel room, Mario wanders the streets, enjoying the night air. It is an activity for the young; he has the energy and vigor to enjoy the nightlife, and to sacrifice sleep in turn. One evening, Mario spots a lonely, yet inviting figure: it is Natalia (Maria Schell), a beautiful young girl whose heart has been broken. Her betrothed has left with a promise to return, but he is nowhere to be found. A year has passed, and their agreed meeting place on a lonely bridge has gone unused. Mario is immediately smitten and quickly befriends Natalia. The naï've girl is reluctant to open up to the affable gentleman, but she soon warms up to his charms, and reveals her story. It is a common tale, one that subordinates poor Mario to the role of elder brother. His patience for her affection turns to frustration as Natalia's dream becomes an obsession. It is an odd pairing: Natalia's love (a brooding Jean Marais) was a tenant at her grandmother's house. A dark figure, he is not young and not quite old, and his mystique suggests a criminal background—certainly not the best companion for the doe-eyed blonde. Mario is convinced her suitor will never return, but the very hope of his arrival keeps Natalia alive. The world of La Notti bianche is peculiar and intoxicating. Shot entirely within the hermetically sealed soundstages of the legendary Cinecittá studio, the film's sets are gargantuan, yet decidedly artificial. At no time is this a convincing outdoor setting—it has a kind of otherworldly feel that is no doubt intentional, but proves somewhat distracting. The setting enables Visconti to control the weather, and allows for some marvelous, almost stage-like transitions. Soon, the viewer becomes accustomed to this fictional world, where the events within are just as odd. This is a story of perpetual night; occasional mornings are glimpsed, but Mario's work life is irrelevant here—only the magical shroud of darkness is of any concern, as is the potential romance it produces. Despite the film's intriguing visuals, the story is somewhat thin. True, atmosphere and style can provide a satisfying sense of substance, but La Notti bianche is somewhat laborious in its swooning, yearning, and aimless wandering. Regardless, there is a compelling sense of wonder here, propelled by the two protagonists. Marcello Mastroianni is wonderfully exuberant, looking for love in all the wrong places. It's quite intriguing to see this regular leading man take a subordinate position; Maria Schell's Natalia has all the control in this relationship, and her obsession with her lost lover is made all the more compelling by her angelic glow. Schell's earnest performance, in a language she could not speak before taking the role, is effective, almost bordering on the kind of silent expressionism found in del sarte. Visconti seems compelled to redefine romanticism through an experience that is realistic, yet completely unreal. It is a paradoxical concept that manages to manifest itself, with mixed results. It's a fine blend of sweet and sour. Come to think of it, isn't that what love is all about? Image Transfer Review: Criterion's anamorphic 1.66:1 transfer is superb. The almost noir-like grayscale of Giuseppe Rotunno's cinematography is captured with impressive detail, solid contrast, and only some fine grain. Excellent. Audio Transfer Review: The Italian monaural is quite clear, and the film's rather sentimental score comes through nicely. Extras Review: The disc's extras begin with a collection of interviews with Visconti's collaborators (16m:53s, 16:9). This piece, recorded in 2003, includes comments from screenwriter Suso Cecchi D'Amico, film critics Laura Delli Colli and Lino Micciché, cinematographer Giuseppe Rotunno, and costume designer Piero Tosi. Topics include casting, lighting, controlling the sets, and more. Here's a nice touch: next is a new audio recording of the film's source material, Dostoyevsky's White Nights. Read by actor T. Ryder Smith, this rendition can also be accessed as an MP3 file via DVD-ROM (a first for DVD? ); perfect for all you iPod fanatics out there. You will also find brief silent screen tests for Marcello Mastroianni, Maria Shell, and the two together. A theatrical trailer is also included; all of these bits are in anamorphic widescreen. Finally, the enclosed insert contains an analytical essay by film scholar Geoffrey Nowell-Smith. Luchino Visconti's fairy tale marks a transition from neorealism to neoromanticism. Its surreal atmosphere and superb performances help make up for the story's wanderings. Criterion's effort brings this important film into the light of day.